On August 2012, seven black Mercedes drove through the Gran Vía, one of Madrid´s main streets. This image reminded of a State funeral, or some kind of military or religious parade. 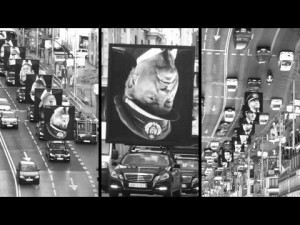 On top of each of the luxurious cars, there was an academic-style painting of a person that had been in “in charge” of the country: king Juan Carlos, preceded the representations of all of the presidents in the Spanish democracy. All the portraits were upside down. While the scene was taking place, people recorded this it with their phones, hung the videos on internet. Although none of them knew who had planned it, the meaning was crystal clear: those “in charge” are politically dead, as the social contract has long been broken. This iconic image was a performative ritual that represented the flagrant crisis of representation in Spain. Some time later, a “professional” video appeared, entitled “Los encargados” (“Those in Charge”). In black and white, and with careful editing, the procession of cars is recorded with the sound track of a subtle music that grows in volume as the film advances. The song is “Warszawianka”, a Polish political hymn which in the Spanish context is recognized for giving the tune to “A las barricades” (“To the Barricades”), an emblematic anthem for the Anarchists in the Civil War. In this performance, the head-downward portraits evoque hanging leaders. Their depiction, without their bodies, also suggests a symbolic decapitation. 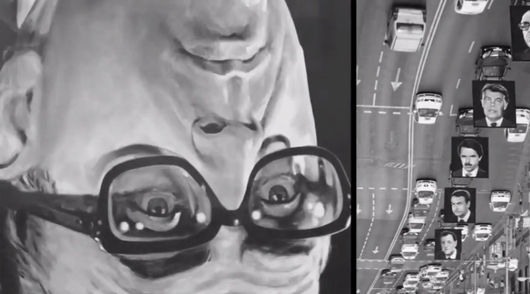 At a certain point, the image of the city is also inverted by film-editing, so that the leaders can be upright: either their heads are exhibited upside down, or the world itself will be the tilted. The order of political representation and the order of reality are obviously incompatible. At the end of the video, there is the sound of an ambulance, a subtle evocation of the beginning of violence. This work was actually a commitment for Helga de Alvear, a prestigious Spanish gallery. The author of the portraits is painter Jorge Galindo, working together with Santiago Sierra, a famous and polemic political artist. Although this piece was produced in the context of the art world, it still works on an activist level. Its clarity in meaning with its explicit call for insurrection, and the diffussion of the video on the internet turn it into a piece of agitprop through the medium of video art.